National Bank of Kenya(NBK) has promised to comply with the new gazetted banking law and subsequently backing up Kenya Bankers Association's(KBA) Inuka Programme with kes2billion.Inuka programme is KBA's initiative aimed at providing low interest loans and training to Kenyan youths and women in business. 1st September, 2016, National Bank Building, Nairobi, Kenya; (NBK) National Bank of Kenya has taken the decision to review interest rates for borrowing customers and depositors in line with the assented bill immediately after the gazettment of the law. The decision followed the signing of The Banking (Amendment) Bill, 2015 into law by the President of the Republic of Kenya. The bill under section 33B1 (a) sets the minimum interest rate chargeable for a credit facility at 4% above the Base rate set and published by Central Bank of Kenya. “National Bank is a compliant bank and a true partner who listens to our customers. We continue to lead the market with competitive rates, true to our foundation objective which remains to be the leading bank enabling inclusive access of low cost credit to all Kenyans,” said Ag. 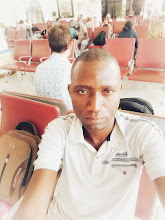 Managing Director and CEO, Mr. Wilfred Musau. 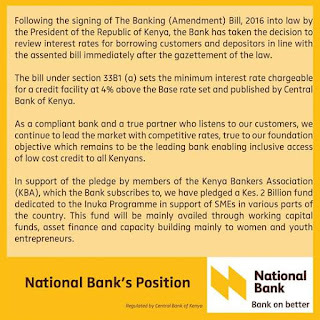 Mr. Musau added that prior to the bill being assented into law, National Bank had taken leadership by reducing its rates by 1% in response to the earlier reduced Kenya Bank's Reference Rate (KBRR). “National Bank continues to enjoy patronage and goodwill from Kenya nationals because of our value and commitment to meeting their enterprising spirit with affordable credit. The bank is launching its Small Enterprise offering to customers this month with more inclusive products and services that are affordable and easily accessible throughout the bank’s network and other integrated channels,” said the CEO. In support of the pledge by members of the Kenya Bankers Association (KBA), which National Bank subscribes to, the bank has pledged a Kes. 2 Billion fund dedicated to the Inuka Programme in support of SMEs in various parts of the country. This fund will be mainly availed through working capital funds, asset finance and capacity building mainly to women and youth entrepreneurs. In addition to a successful rebranding exercise, National Bank continues to grow its footprint in all counties. Currently, the bank has over 80 branches, over 1500 agents countrywide and access to over 1,000 ATMs. The bank has over the years invested in technology and now prides itself as one of the top banks in digital offering through internet and mobile banking channels.